You will see that I am not alone. I've been itching to test my panel cooker design against the Hotpot, by placing the bowl from the Hotpot in both, and timing how fast they heat up the bowl. From the pictures you can see how small the Hotpot Cooker is when it is folded. 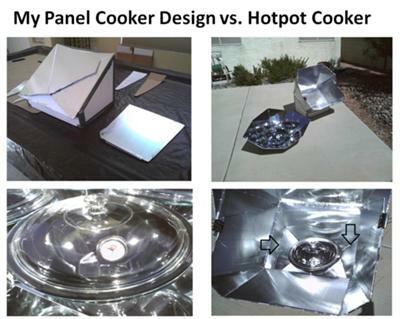 It may not be ideal for baking, the way the SOS Sport and GSO are, but the addition of this cooker to my solar cooker repertoire is assured by its portability, and you can bake in it by accepting a different shape (the bowl itself) or using a small enough cooking vessel, to fit within the bowl. My panel cooker is made of foam board, and I designed it so that the lower panel folds into the box, the side flaps cross over that, and the top panel sides fold back over the back of the top panel, and collectively fold forward onto the side panels. My cooker is very light, and cost around $10 to make (2 large foam boards and a third of a roll of aluminum foil tape). The box area is 14" x 18 1/2" and can accommodate a turkey roaster with no problem. In previous tests, I found that when using a smaller pot, light would bounce out of the bottom box's corners, so in this test, I simply place a couple of aluminum foil covered triangles that I had left over, in such a way as to aim that previously wasted light, towards the center. I tested the Hot Pot Cooker first, and it's ability to heat up was impressive. The steel bowl within the lidded glass bowl is excellent. UV rays enter, hit the black steel pot, causing them to change into a longer wavelength that cannot exit the glass, which is now opaque to the longer wave. The Greenhouse effect in action. When I tested my cooker, I started the clock when the bowl thermometer hit 150F so that I could use a similar sun angle. I could have waited for the bowl to cool back to ambient temperature but conditions were steady (no clouds, light winds) so why not let the bowl cool to less than 150F and begin the comparison from that temperature. At first the results looked exactly the same, so I focused the panel cooker a bit better, and that made the difference, as you can see from the data and graph. Hopefully others with Hotpot Cookers can share their test data as a point of comparison for Las Vegas. Great Comparisons of two similar cookers. The Panel Cooker you made looks as though it has greater capacity to capture and focus the suns rays, even more so than the reflector panels of the Hot Pot. 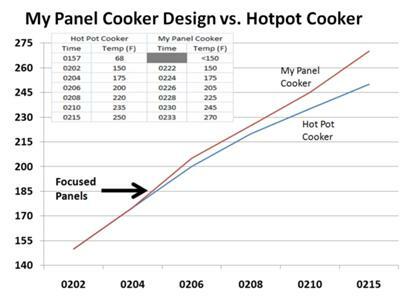 My Hot Pots perform great, so with your panel cooker you can reach even greater results. Good demonstration of what added "tinkering" can produce beyond the typical or accepted standards.